The WATT Executive Guide to World Poultry Trends is published annually to provide the latest poultry and egg market data in one place. 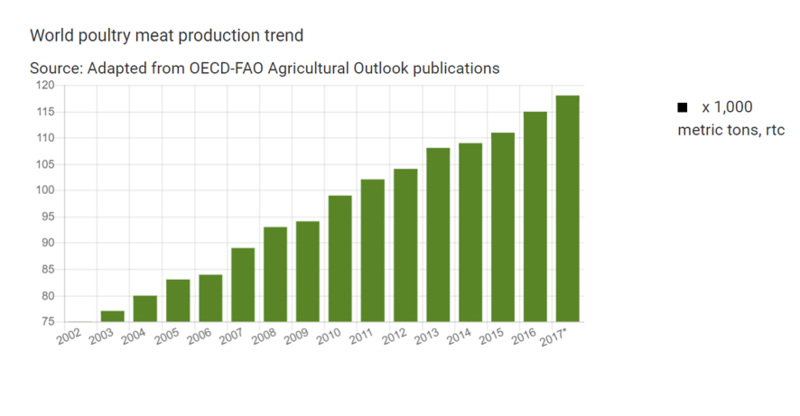 Poultry Trends contains both regional and global statistics on poultry meat and eggs, covering production, consumption, trade, and the leading poultry producers and feed manufacturers worldwide. The statistics are collected from reports by different governmental agencies, including the U.S. Department of Agriculture and the Food and Agriculture Organization, as well as exclusive data from WATT’s Top Companies database. Click on the links below to view lists of the poultry and egg data. The market statistics are broken out geographically, as well as by species. You can click to read the latest issue, which provides forecasts, analysis, and other charts and tables as the statistical reference for the poultry and egg industry.